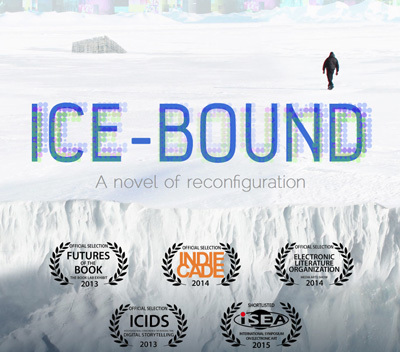 Ice-Bound, an interactive fiction piece created by two graduate students in the UC Santa Cruz Center for Games and Playable Media, has won the Story/World Design Award at the 2014 IndieCade International Festival of Independent Games. The IndieCade festival is a highly competitive and influential venue for independently made computer games, according to Jim Whitehead, professor of computational media at UC Santa Cruz. The Story/World Design Award honors the special craft of revealing narratives through interactions within an imagined world which players want to inhabit and explore. Ice-Bound combines interactive digital technology with a printed art book to create a new kind of story involving doomed polar explorers and a self-doubting artificial intelligence (AI). Its creators, Aaron Reed and Jacob Garbe, are both graduates of the Digital Arts and New Media M.F.A. program and are currently working toward Ph.D. degrees in computer science in the Baskin School of Engineering at UC Santa Cruz. "Ice-Bound is a new kind of interactive narrative where a dynamic, evolving story on an iPad can be altered using a physical book," Reed said. The premise of the story involves an author's unfinished masterpiece about a mysterious polar research station, and a digital simulation of the dead author created by his publishing company to finish the novel. "Through interacting with this AI doppelganger, you get to rearrange different stories and see how they fit together, and even how they end," Garbe said. Reed and Garbe have launched a Kickstarter campaign to help pay for a high-quality print run for the book portion of the project. The interactions between the physical art book and the digital app are essential to the story. The app, using the iPad's built-in camera (or a PC with webcam), recognizes the pages of the book and can change them in front of the reader using augmented reality. "But showing the AI character pages of the book might change him too, and alter the course of his unfinished novel," Reed said. "And it's not just a gimmick. This two-way interaction between the physical and digital parts of the story is the central mechanic of the whole game."